I'm so glad you stopped by today for the Technique Junkie Technique by Design Blog Hop! You should have arrived from Jane's Blog, if not, click here to start at the beginning of the hop. Today, members of the TJ Design Team are sharing artwork created using the June Technique by Design Sketch, along with some of the new techniques found in the June Newsletter. 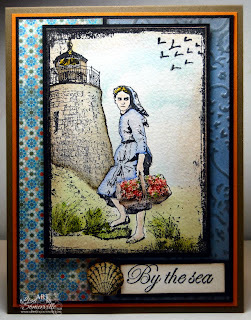 To create my card, I used the new Beyond the Sea and Bloom and Grow plates from Artistic Outpost. If you've stopped by my blog this last week, you may have noticed I'm really giving that "seed packet" image a workout! With a little masking, it's the perfect frame for a lot of the images from Artistic Outpost. After stamping/masking the frame, I added the gal from Beyond the Sea, masked her with Eclipse Tape, then added the Lighthouse. The images are colored using one of my favorite techniques, Marker Watercoloring. I added some Flower Soft to her basket, and sponged in some clouds in the background. Following the Sketch, on Panel B, I used the Antique Wallpaper Technique found in the June issue, then added the sentiment and shell image. Once my card was assembled, I spritzed it lightly with Pearl Glimmer Mist. Remember when you use Glimmer Mist shake in a left to right (side-to-side) motion, if you shake up and down, the paint will clog your straw. Give it a little sprtiz to get out the air bubble, then lightly mist over your project. Don't forget to check out the Giant TJNL CD Sale. If you already own all the CD's, these make great gifts for the stampers in your lives! But hurry, this CD Sale only runs through the end of the month. I hope you enjoyed my project for the Technique By Design Hop, your next stop is Kimm's Blog. If you'd like to play along, you can check out the details on Pat's Blog, on how you can enter to win a fabulous prize from the TJ Vendors. Wish I was there! Looks like a painting, how beautiful. You rocked the hop! I love your watercolor works! Gorgeous card - love the flower soft on here too. I have a bunch, now I just need to pull it out and master it, like you have! :) TFS! Awesome card. You did a fabulous job with masking the images. Gorgeous! What a beautiful card!!! Love this image and I love how you used two differnt papers as your backround. Great distressing!! I always like what you do, Lisa! Nice job! Your card is amazing...It looks like a "real" picture...Gorgeous! I love all of these images together Lisa!